She’d said she was proud of him—did she mean it? Her forearm brushed his leg, and her throat turned a deep shade of rose as she held his gaze. Sweet. She wouldn’t say what she didn’t mean. Jackson snapped back. Was she inviting him inside? She held the door open for him, and he followed her. The instant they were out of sight she launched herself at him, wrapping her arms around him to hold him tight—he couldn’t have broken free if he’d wanted to. He buried his hands in her soft, soft hair and cupped her head so that he could study Emma and memorize each new line and freckle. He gently brought the pads of his thumbs to her smooth jaw and plump pink lower lip. Her eyes, swiped with copper, glittered sensually as she absorbed his touch. Auburn lashes at half-mast as she relaxed into him. He dropped one arm to her hip to balance her, the other still cradling her head as he lowered his mouth. She lifted to him, their lips whispering across each other’s mouths before crashing together like surf against the sand. She tasted different but the same. It was meeting his other half, something he’d been missing and suddenly needed more than his next breath. “Jackson.” Her words were hot against his lips and brought the embers of desire flaming bright. She entwined her fingers behind his neck and pressed in to him. He clasped her tight, feeling the warmth of her feminine curves, the temptation she offered. The smack of sneakers up the porch steps made them break away like guilty teenagers. Jackson’s chest heaved. They weren’t that anymore. 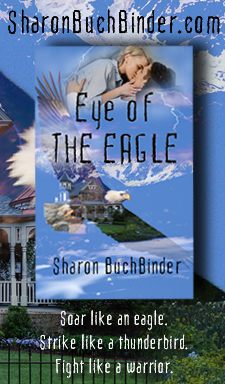 Em’s eyes flashed, the pulse at her neck fast as a hummingbird’s. “Sure, hon. I was just getting the cannoli out. Are you ready for dessert?” Emma turned her back to him, and Jackson detected a tremor in her voice. Jackson knew then that he’d never be over Emma Mercer, not if he lived to be a thousand.